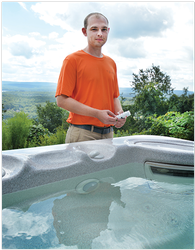 Let our professional staff take care of all your hot tub needs. DCL Hot Tubs is certified by the Maryland Department of Health, meeting the strict requirements for the safe and healthy operating conditions for your tub. You'll rest easy knowing your spa/pool water is clean and bacteria-free. Qualifications: Owner will purchase - Bromine dispenser, Filter must be replaced as needed, strap and lock (DCL Hot Tubs will install). Contact DCL Hot Tubs for more information. What does it really take to service a hot tub? Your hot tub's water is the focus of all daily maintenance activities. There are three primary actions that are essential for keeping your spa in tip-top shape. First, you'll want to check the sanitizer levels by using hot tub test strips, which are inexpensive and available at any pool or spa store. This will tell you if you need to add a dose of chlorine or bromine to the water. Next, it's important to know what the pH balance is in your tub's water on a daily basis. You should stock chemicals to make the water more acidic or more alkaline as needed to maintain the optimal balance. Finally, all hot tubs that get frequent use accumulate body oils, perspiration, and other unpleasant materials that can stain the water line. Regular maintenance includes checking for and cleaning this recurring line so it does not become a permanent stain. Pastes and sprays are made that will accomplish this task easily and inexpensively. On a weekly basis, you should add an anti-foaming agent to your hot tub's water. Foamy bubbles are very annoying while you're in the water. You should also remove and clean the spa's filter thoroughly. This is very important for your tub's long-term efficiency and the water's cleanliness. Finally, if you live where the water is hard, add an anti-scaling chemical to prevent the build-up of calcium deposits on the walls and floor of your hot tub. Every month or so, it's a good idea to add a water sparkle agent to keep your hot tub looking bright and clear. This is really just an esthetic issue and is not critical in your tub's maintenance routine, but most owners find that a pleasing visual appeal adds to the experience. The other monthly maintenance regimen is to check the tub's interior and exterior carefully for gouges, dings, and cracks. Spotting these problems and repairing them early will prevent a major and costly headache later on. Every 3-6 months (depending on frequency of use), you should fully drain and inspect your hot tub. Give it a good scouring while empty and take apart and clean the entire filtration system as well. Unless you’re hot tub is being used at a vacation rental, then it is every 4 weeks or as needed. Regardless of whether you purchase an ozonator or ionizer you will still have to keep up your water chemistry. These extra devices will reduce the amount of chemicals used but they will not eliminate them. Water maintenance is a simple task once the water level is in balance. There are two tests that I concentrate on. The 1st is the level of chlorine or bromine. The 2nd is the PH level. These control the bacteria and acidity. With our assistance your Hot Tub will be as refreshing as if it was the first time you entered. Water hardness and total alkalinity is something you may have also read about. These become important only if your water supply is at the extremes (for example water too soft). In that case you may experience premature failure of some metal parts, such as the heater sheath. This can be adjusted by adding suitable minerals. Monthly cleaning of your filter is recommended. The cleaner the filter is the more efficient your pump will be. Because a clean filter allows more water circulation, you will also find your water stays much clearer. A filter can be cleaned using a tap or garden hose. Using a pressure washer as this can damage the filter. I also recommend using filter cleaner chemical. This chemical aids in breaking down dirt and debris resulting in an almost new filter. I recommend replacing the filter with a new one on an annual basis or if used in a vacation rental, twice a year. Also important, is to check for debris that may collect on the bottom intake suction. This suction has a cover that prevents any larger objects from being sucked in. It can easily get clogged by fibers, hair, and leaves. Clean this each time you use the hot tub by reaching into the water and removing debris. Typically most people feel that 37 - 39 C (98 - 103 Fahrenheit) is a comfortable temperature, however, we recommend you contact your doctor to determine if a hot tub is safe for your given health condition.